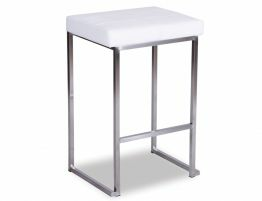 Affordably update your restaurant stools or barstools with our ultra-modern Cantona commercial & residential barstool. 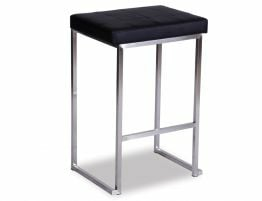 The Cantona modern bar stool has a brushed stainless steel frame & stitched, padded seat cushion in black. 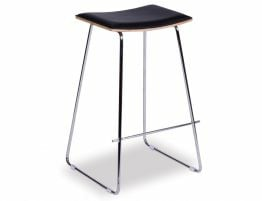 This stationary bar stool offers a contemporary look in black & the brushed stainless steel looks chic and modern. 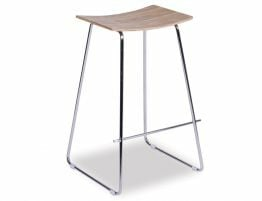 The stainless steel legs and frame give these fine-looking stools added strength and stability to stand up to the rigors of customer use. The padded cushioned seat offers guests optimal comfort and the upholstered seat cushion offers the look of leather in a stain resistant, fade resistant and easy to care for material. Perfect for your espresso bar, your cocktail lounge or restaurant bar seating. Our sleek, minimalist modern bar stool pulls inspiration from stark, geometrical forms. Create a tailored, spare look in your cafe or bar seating area with the sleek form and unparalleled style of these brushed stainless steel and black bar stools. The backless design of these commercial barstools makes them sit under most counters neatly letting the rest of your space take center stage. With a carefully thought out streamlined design, stainless steel frame and rich black upholstery, the Cantona backless bar and counter stools looks tailored and sophisticated. 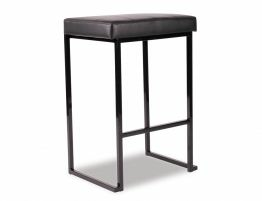 The sleek, jet black upholstery over a plush, cushioned seat lend a certain softness to this otherwise stark, geometric bar stool. The chic black leather-like upholstery would be a great fit with monochromatic, black and white design and bright modern colour trends. Pair this design staple with bold clarets, warm yellows, muted blues or other on trend colour palettes. The comfortably padded seat and back are upholstered in a leather like material that that feels great and is easy to clean. 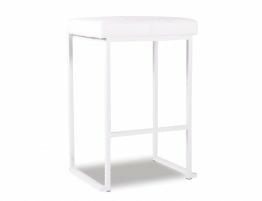 Our commercial bar stool offers a simple, understated piece of minimalist commercial bar furniture.